PR-619 is a non-selective, reversible inhibitor of the deubiquitinylating enzymes (DUBs) with EC50 of 1-20 μM in a cell-free assay. Ubiquitination inhibitor PYR-41 and deubiquitination inhibitor PR-619 pretreated macrophages with or without Teuvincenone F (25 μM) for 2 h, following stimulated with LPS (100 ng/ml) for 30 min, and then subjected to immunoprecipitation with anti-NEMO antibody followed by immunoblot analysis with specific antibodies. Similar results were obtained from three independent experiments. P5091(P005091) is a selective and potent inhibitor of ubiquitin-specific protease 7 (USP7) with EC50 of 4.2 μM and the closely related USP47. (e) MM.1S cells were treated with RRx-001 (1.25 μM), P5091 (3 μM) or RRx-001 plus P5091 for 12 h; protein extracts were analyzed for total DNMT activity using the EpiQuik DNMT activity kit (mean±s.d. ; P<0.001; n=3). (f) MM.1S cells were treated with RRx-001 (1.25 μM), P5091 (3 μM) or RRx-001 plus P5091 for 12 h; protein lysates were then subjected to immunoblot analysis using antibodies specific against p21, HDM2, p53 or GAPDH. IU1 is a cell-permeable, reversible and selective proteasome inhibitor of human USP14 with IC50 of 4.7 μ M, 25-fold selective to IsoT. LDN-57444 is a reversible, competitive proteasome inhibitor for Uch-L1 with IC50 of 0.88 μM, 28-fold selectivity over isoform Uch-L3. Representative results of Western blot showed the effects of LDN (10.0 μM) treatments on the expressions of LC3-II and LC3-I from Normoxia and OGD groups of cPKCc+/+ and cPKCc/ cortical neurons (n = 6 per group). TCID is a DUB inhibitor for ubiquitin C-terminal hydrolase L3 with IC50 of 0.6 μM, 125-fold selective to L1. P22077 is an inhibitor of ubiquitin-specific protease USP7 with EC50 of 8.6 μM, also inhibits the closely related USP47. b-AP15 is a deubiquitinases inhibitor for 19S proteasomes activity of Ub-AMC cleavage with IC50 of 2.1 μM. A USP14 inhibitor directly inhibits OSCC cell proliferation and triggers apoptosis. (A-D) OSCC cells were treated with indicated doses of b-AP15 for 24 h. (A) Cell proliferation was monitored by CCK8 assay. b-AP15 dramatically decreased cancer cells viability in a dose-dependent manner (p < 0.01). All values represented means ± SD of three independent experiments and each was performed in triplicate. (B, C) Flow cytometry analysis indicated that b-AP15 triggered significant apoptosis of OSCC cells (p < 0.01). Data were obtained in more than three independent experiments. (D) Apoptosis-related proteins were examined by western blot analysis. 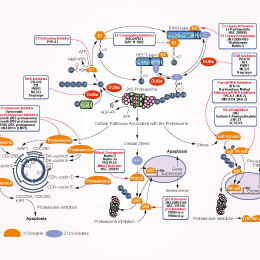 Inhibition of USP14 with b-AP15 induced a massive increase of ubiquitinated proteins, which then triggered apoptosis of cancer cells, activating caspase 3 to induce cleavage of caspase 3 and PARP. VLX1570 is a competitive inhibitor of proteasome DUB activity, with an IC50 of ~10 μM in vitro. ML323 displays reversible, nanomolar inhibitory activity and excellent selectivity toward USP1/UAF1 with IC50 of 76 nM.